RNZ’s Veronika Meduna, one of the country’s most experienced and respected science journalists, finished up co-hosting the popular Our Changing World show last week. After 17 years at the broadcaster, most spent producing and fronting science and environment stories for Our Changing World, it wasn’t her choice to go. Frozen budgets at RNZ and restructuring to achieve audience growth and improve the public broadcaster’s digital presence, have forced some difficult decisions, with long-running shows and well-known names among the casualties. RNZ says it will continue to have a strong focus on science and the Our Changing World show remains in a reduced 20 minute format featuring Veronika’s co-host of the past eight years, Alison Ballance. But Veronika has no plans to leave science reporting behind. We asked the former microbiologist and award-winning writer to reflect on her time as a science broadcaster, on how science communication has changed over the years and her future plans. Q1: What edge does radio have over other mediums when it comes to covering complex science-related issues? 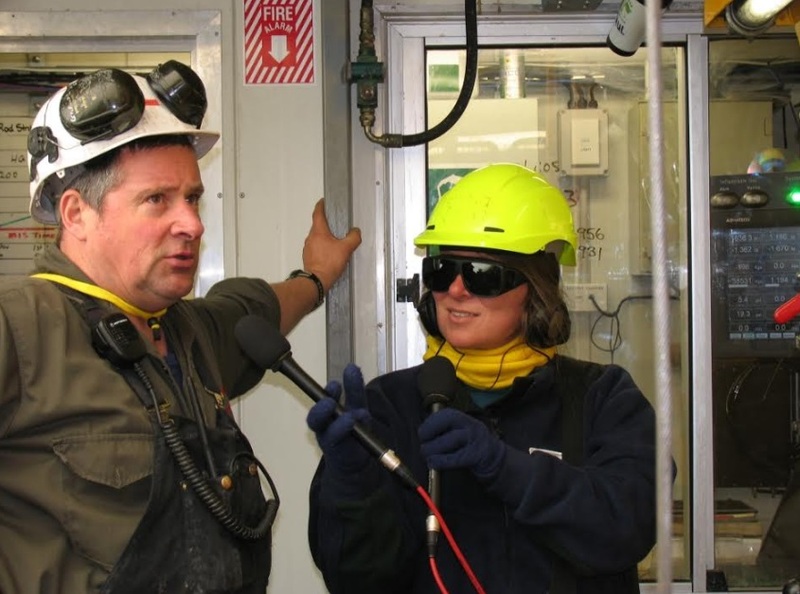 Veronika interviewing drillers as they retrieve sediment from hundreds of metres below the Ross Ice Shelf during the ANDRILL project. Q2: What’s the story you covered on Our Changing World that you are most proud of? That’s an impossible question to answer. Even by the roughest estimate, I’ve covered hundreds of science stories, and I don’t really measure them by how proud I am of what I did, but rather by how inspired I have been by the people and their stories, and how the audience responded to them. The most memorable stories include those where the interviewees showed courage in telling them (e.g. parents of children with rare genetic conditions), where a scientist’s passion shone through (just about any story recorded during a fieldtrip), where scientists speak out in defence of evidence (plenty of those, just think of any science/society issue such as climate change, obesity epidemic) or where science becomes an adventure (hunting for dinosaur fossils, carrying a box of rare birds during a translocation, trying to get some sleep in Antarctica). 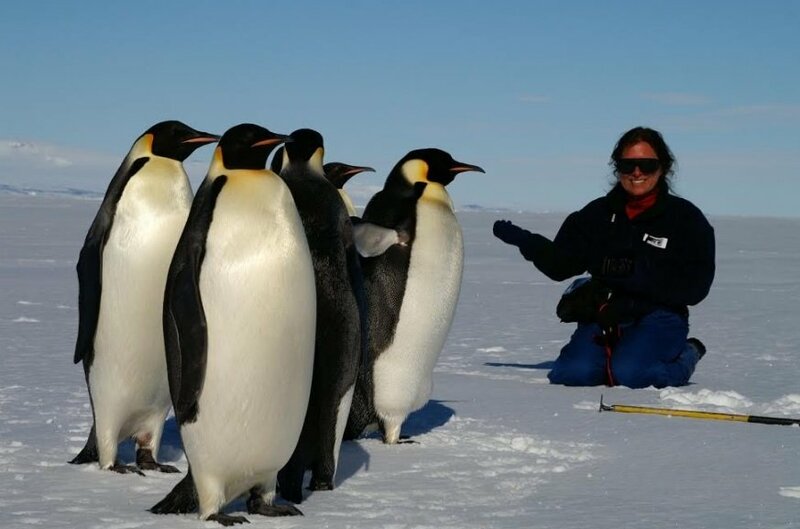 Veronika encounters Emperor penguins at the edge of Antarctica’s sea ice. Q3: Do we still need specialist science reporters? More than ever. But then I would say that, wouldn’t I? But seriously, I don’t need to be a musician to find beauty in a Bach sonata but I do need to have some knowledge about evolution to understand why it’s such a powerful idea. 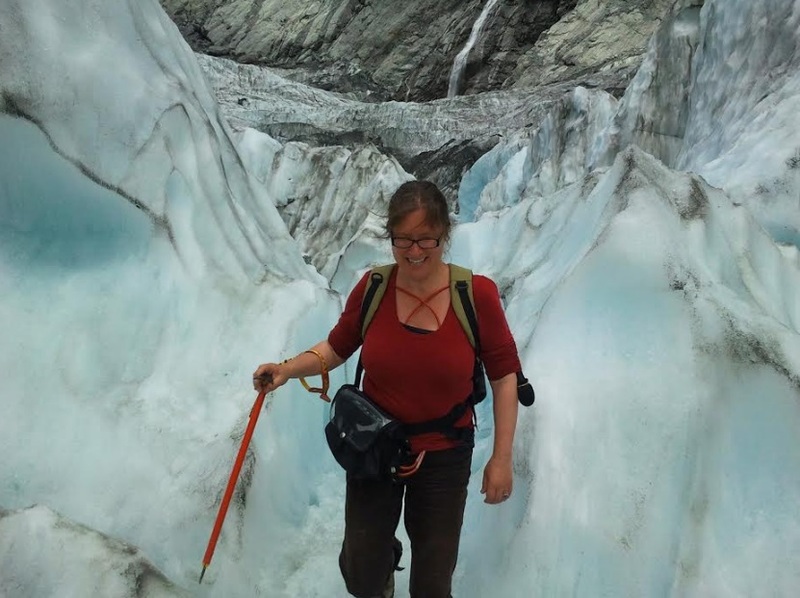 Veronika joins Victoria University glaciologists at Franz Josef glacier on the West Coast as they monitor its rapid retreat. Q4: Are scientists better at communicating their science than they were when you started? Yes and no. There are those who just simply enjoy talking about their work and they were good at it then and still are now. They don’t even think of it as science communication. But I’ve also seen huge improvements over the years, with many scientists stepping up to the challenge, often thanks to the Science Media Centre’s work. I suspect that some scientists are reluctant to engage more with the media not because of a lack of skill but because of concerns about the reaction they get from the public and their colleagues. There is still room for improvement in this aspect of the culture of science. Science communication and any form of outreach (I so dislike that word, but can’t think of a better one) is still undervalued in some science organisations. 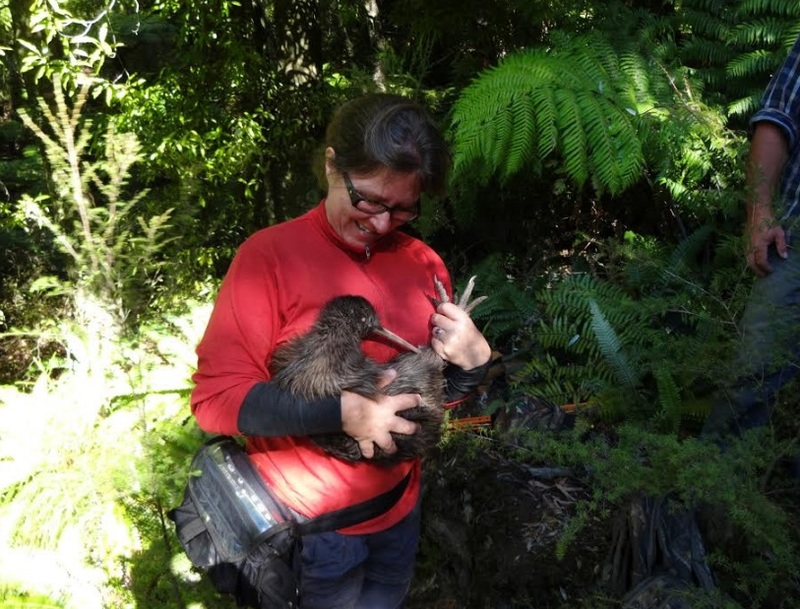 Veronika during a fieldtrip in the Maungataniwha native forest owned by the Forest Lifeforce Restoration Trust, which is part of the kiwi conservation project Operation Nest Egg, restores kakabeak in the wild, and is a good place to go hunting for dinosaur bones. It was a bit of a wrench to leave RNZ and to watch my job disappear in a restructure, but I’m looking forward to some exciting new opportunities, some of which will be in association with RNZ. I’ve joined the fabulous Science and Society team at Victoria University and am really looking forward to working with Rebecca Priestley and Rhian Salmon, their team and students. 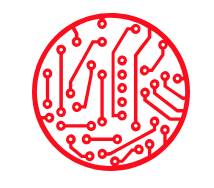 I’m working on a project with Motu, which is exciting and challenging at the same time. I’ll continue telling New Zealand science stories – in radio for Deutsche Welle’s Living Planet programme, in digital for the ABC and in print and digital for New Zealand Geographic. I’ve got another book project on the go and there’s a super exciting possibility on the horizon which is just a bit too early to talk about. Best of luck Veronica and thanks to you and your colleagues for your sterling contribution. I will miss your voice! Best of luck to Veronika and I fully agree, all media need specialist science reporters and journalists (I reckon they are different) who have a knowledge base with which to find the real story, beyond the spin. I suspect that this says it all: “where scientists speak out in defence of evidence (plenty of those, just think of any science/society issue such as climate change, obesity epidemic) “. This government hates truth tellers who don’t parrot the Party line. I will miss Veronika and her perceptive questions and observations. I am concerned at the direction RNZ seems to be taking and I hope they soon reveal a masterplan that show that they are not “”dumbing down” although the evidence so far seems to suggest they are! All the best Veronika and hopefully you enthusiasm can be used with the next generation of scientists!